A day is a period of time that has existed based on the most obvious natural clock we have: the Sun. For most places on the Earth, a day is the amount of time that elapses between when the Sun is at one point at the sky (say, the zenith) and the next time the Sun is at that point. Us moderns define a day as a period of 84000 seconds, or 24 hours exactly, since the amount of time that elapses between the Sun’s position at two successive intervals varies from place to place and according to the seasons. We like accuracy and uniformity of units, after all, and that can be forgiven, especially when we have trade and travel that crosses massive distances when time relative to one point isn’t the same as time relative to another. Each day was then seen to be good for a certain kind of activity which related to its ruling planet: Mercury was good for business transactions and travel, Friday for parties and romance, Monday for paperwork and tidying up the home, and so forth. The occultists who devised this system, fond of complexity as they are, went one step further and ascribed each of the 24 hours of a day a ruling planet as well, so you could mix the powers of different planets together for a complex project or use the amplified power of a planet in its own day and hour for a specific task. The traditional set of 24 hours weren’t hours as we think of them, however, where each hour is 60 minutes. They were divisions of daylight and darkness, the diurnal and nocturnal hours respectively, and they changed lengths over the course of the year as nights and days became longer or shorter in turn with the seasons. The length of one diurnal hour was one-twelfth of the time from sunrise to sunset, and the length of one nocturnal hour was one-twelfth of the time from sunset to the next sunrise. This was commonsense to people before clocks, of course, since the shadow cast by the Sun would move across the equally-spaced markings on a sundial. This also meant that a day wasn’t officially over until the next sunrise, so although we might consider 4:00 a.m. on a Tuesday morning to be, well, Tuesday, to the older folks it was still Monday. Once the lengths of the diurnal and nocturnal hours was known, occultists had to decide how to ascribe the planets to each of the hours. Since it was fitting that the first hour of the day should set the tone for the coming day, they ascribed the first hour the planet that also ruled that day. So, the first hour of Saturday was ruled by Saturn, the first hour of Sunday by the Sun, and so forth. After that, they used the order of the planets that organized them from slowest to fastest, or furthest from the sphere of the Earth to the closest: Saturn, Jupiter, Mars, the Sun, Venus, Mercury, and the Moon. So, if the first hour of Sunday was ruled by the Sun, the second hour would be ruled by Venus, the third by Mercury, the fourth by the Moon, the fifth by Saturn (at this point the order of planets repeats), the sixth by Jupiter, the seventh by Mars, the eighth by the Sun again, and so on. The weekday heptagram may help illustrate this. The order of the planets from slowest to fastest, or from furthest to closest to the sphere of Earth, can be read clockwise starting at Saturn to the Moon; this is the order of the planetary hours as well, and all you have to do is just keep going around the circle. 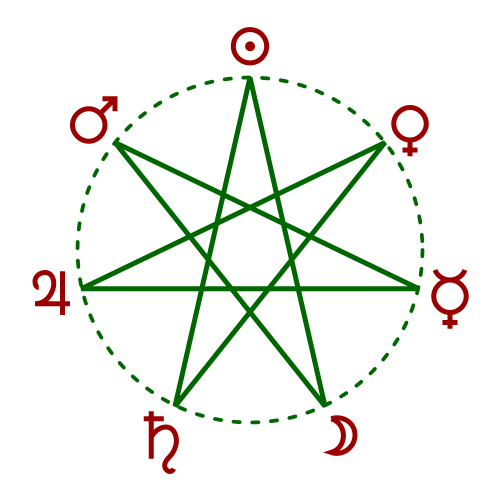 The order of the rulers of the days of the week are given by the seven-pointed star, going clockwise from the Sun to the Moon to Mars and so on. Just like the days of the week repeat week after week, the star itself goes on and repeats after each iteration. Using this system of planetary days and hours, you can pick convenient times to work on or create a planetary talisman or summon a particular spirit. In fact, a number of the old grimoires and texts demand that you conjure an angel of a planet only in that planet’s day and hour. Work related to that planet will go smoother and can help sidestep, though not completely, the problem of finding good elections in astrology for beginning or finishing some task. There’s more to the hours than just the planets, too: they’re ascribed individual names, angels that watch over them, angels related to the planets, and other information that comes up in some forms of ritual magic. Thankfully, we don’t have to calculate all this by hand anymore. The National Council for Geocosmic Research has a handy web application that can tell you the planetary hours for the current day based on your location, and this planetary hour calculator can tell you the planetary hours for any given date and location. If you have a smartphone, Hours may be of interest and use to you if you’re planning things astrologically on the go.